After delaying the UGC NET notification for more than two months, the Central Board of Secondary Education (CBSE) released details of next exam recently, but, again with extended dates. New Delhi: After Central Board of Secondary Education has notified November dates for CBSE UGC NET, aspirants and students organisations expressed their anger against the move to curtail the bi annual examination to a yearly event. After delaying the UGC NET notification for more than two months, the Central Board of Secondary Education (CBSE) released details of next exam recently, but, again with extended dates. Activists of Students Federation of India (SFI) staged a protest today in front of University Grants Commission (UGC) headquarters, ITO, Delhi against the move. SFI condemned the 'atrocious move' by the UGC to scrap the exam scheduled for July which will now happen on 19th of November. Earlier, UGC National Eligibility Test (NET) was conducted twice in a year - January and July. It is a qualifying examination for the post of Assistant Professor or Junior Research Fellowship or both. "This also means that the NET exam in December won't be happening this time. This leads to a situation where under the carpet the ministry is curtailing the bi annual NET examination and making it a yearly event", said a statement from the student body earlier. 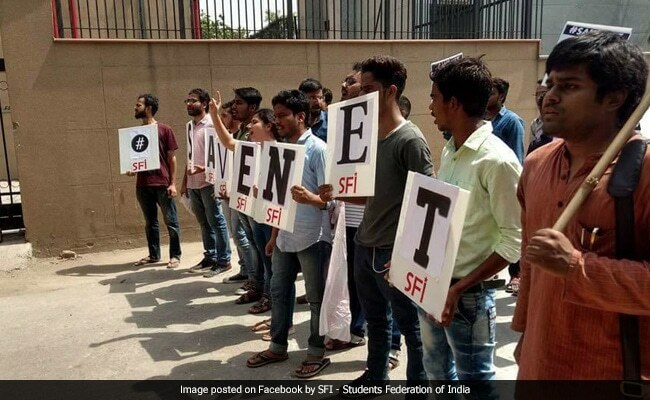 If it the exam is held yearly, SFI said, the number of students qualifying NET every year will effectively be reduced to half and all this is being done without any policy document of the UGC. "The functioning of UGC lacks absolute transparency and this also exposes the nature and authoritarian way of functioning of this government", the statement added. Another student organisation, Student Islamic Organisation (SIO) accused UGC of betraying the student community by not conducting NET July 2017 session. "Thousands of aspirants, who are waiting for CBSE UGC NET notification, are shocked now after seeing the latest update. CBSE should take back its stand in favor of thousands of students, it's a direct attack on the students, teaching profession and intellectual growth of the nation" said Nahas Mala, President of SIO in another statement. The next CBSE UGC NET 2017 will be held in November. Official update which was released last week said the online registration will begin on 1 August 2017. CBSE, the official organiser of the exam will release the detailed notification on July 24, 2017. Candidates will be given can submit their applications till 30 August 2017.